Continuing our series on CAT 3306 Air Inlet and Exhaust Problems, Part 2 of the series explores the Aftercooler and Turbocharger for air flow restriction issues. 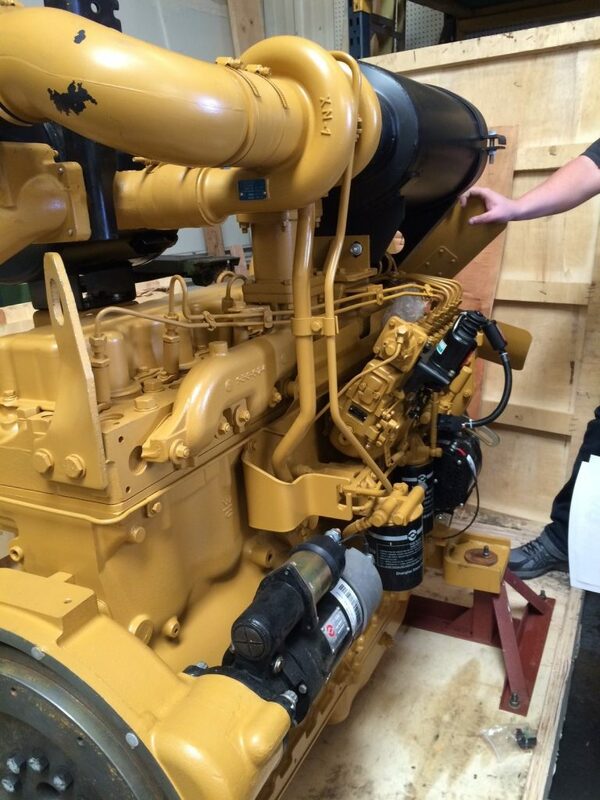 The CAT 3306 is built on simplistic old school mechanical engineering. There really aren't too many glaring issues with the turbo or aftercooler (intercooler) however this article will dig deeper into some of the most common problems regarding the air flow. The turbocharger should be inspected every 7000 - 7500 hours for abnormal vibration or noise. Any issues that are noticed would point to a problem with the turbo’s internal bearings. Don’t worry though, a quick inspection of the condition of the bearings can be accomplished without completely disassembling the turbocharger. To inspect the bearings you can remove the piping from the turbocharger and inspecting the compressor impeller, turbine wheel and compressor cover. Once you have inspected the condition of those parts rotate the compressor and turbine wheel assembly by hand and get a feel for excess end play and radial clearance. The rotating assembly should move without any restrictions which includes any rubbing or binding up in one particular spot. 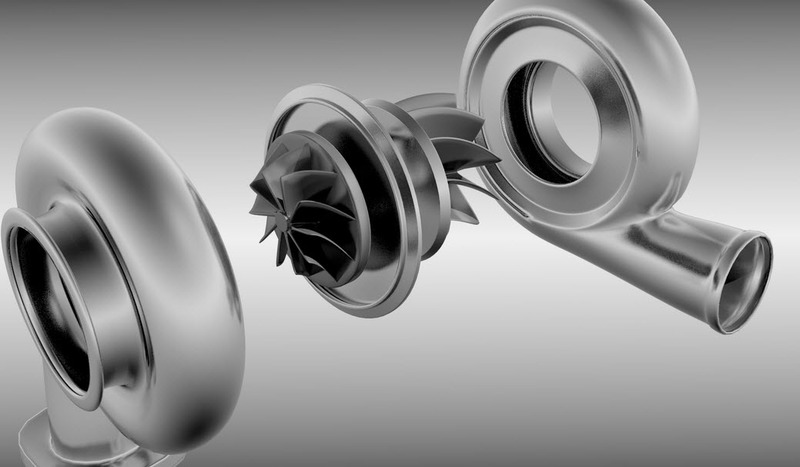 If you feel the impeller is rubbing against the inside of the compressor cover or the turbine wheel is grinding against the inside of the turbine housing, pull a part the entire turbo as the bearings are shot or simply replace the turbo. End play clearance isn’t something that you can just “eye ball”. Sure you can feel if something is amiss, however clearance is best measured with a dial indicator. To measure the clearance attach a dial indicator with the indicator point on the end of the shaft. Slowly move the indicator from end to end making note of the reading around the radius until the entire clearance is accounted for. The later model CAT 3306 and 3304 stock engines usually came with TV61 and TW61 Turbochargers. The correct end play should be .003 to .010 in (0.08 to 0.25 mm respectively). For upgraded T12 Turbos the spec end play should be .006 to .011 in (0.15 to 0.27 mm respectively). If the end play is out of spec you will know. 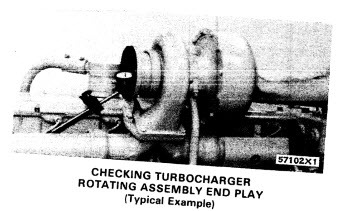 The only way to correct a surplus of end play is to either rebuild or replace the turbocharger. Consequently if the end play is below spec it could indicate carbon build up on the inside of the turbine wheel. The fix is to simply disassemble and clean the turbine wheel or replace worn parts. Much like end play clearance, radial clearance can also be measured with a dial indicator. To check for radial spec first detach the oil return line from the turbo. The most accurate reading without completely disassembling the turbo is through the oil return hole. Don’t be lazy here, failure to remove the return line will give inaccurate readings. Attach the dial indicator with an extension indicator point long enough to make contact with the shaft. It is a tight squeeze through the oil return hole but make sure the contact point is directly centered on the shaft. The center of the shaft will give the highest indicator reading. With the dial indicator raise the both ends of the shaft all the way and push down in the opposite direction. Total radial movement of the shaft should be between .004 in and .009 in (0.10 mm and 0.23 mm respectively). 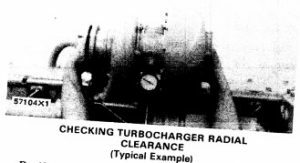 If the radial clearance exceeds or falls below spec the bearings need to be checked and/or replaced through total disassembly of the turbocharger. It is important to note how sensitive a dial indicator can be. If the shaft is cocked at a weird angle a false radial reading will be obtained. Checking the radial clearance through that oil return hole is tricky due to the angle and not being able to clearly see the dial indicator make contact with the shaft. It is advised multiple readings be obtained to make sure of the accuracy. up Part # 9S9102 is specifically built by Caterpillar to measure aftercooler operations. 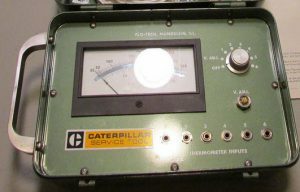 This device is used to measure the temperature of the fuel, water, oil and air in a myriad of engine structures. The device come with 9 probes (red, yellow and black) as well as several fittings. Ambient range of the thermometer is between (–20°F to 2500°F). Not all CAT 3306 engines have an aftercooler system which further reduces ambient air temperature after being expelled via a turbocharger or supercharger. Aftercoolers are either air or liquid cooled. Use special instruction form No. GEG01024 which give the operating instructions for engines with water cooled (mist spray) aftercoolers. The Thermistor Thermometer Group will also work for air-to-air cooled systems as well which rely heavily on engine coolant. Aftercoolers, or more commonly known as Intercoolers, often fail between the turbo hose and the unit or between the intercooler and the engine downstream . A hose that becomes loose around the couplings or has a hole in it will cause a drop in pressure of the compressed air. If the air flow is not at optimal levels either there will be an excess of air to the combustion chamber or a deficit. If the there is an abundance of compressed air from a busted line or valve the air-fuel flow mixture will be off causing less fuel to be burned off. Excess fuel will be pushed out with the exhaust causing grey or black smoke and degrading fuel economy and horsepower. Many times with electronic engines with emissions equipment the like EGR Cooler or DPF regeneration issues can cause excess exhaust particles to clog the turbo and breakoff thus causing damage to the aftercooler. Other turbo issues include over compensation (spin cycles) for loss of boost pressure from a damaged aftercooler. The wastegate functionality will keep air flow going via a bypass valve. If the leak is relatively minor there will be a discrepancy between acceleration and the extra turbo regen cycle. A major loss in air pressure will cause electronic engines with an ECM to go into limp mode and restrict speed and performance to save critical engine parts. CAT 3306 engines are grandfathered into the EPA Tier Regulations and for the most part these engines had no emissions equipment or regen issues typically associated with post 2000 year Caterpillar models. Lastly, engine coolant can leave mineral deposits used in air-to-water aftercooled engines which can clog up the inlet and exhaust functionality of the aftercooler. These clogs will restrict air flow from the turbo and exhaust to the combustion chamber. The use of additives can reduce mineral deposits from the coolant. Common components to inspect include the intercooler valves, boost sensors, seals, rings, hoses, nozzles and air and exhaust elbows. 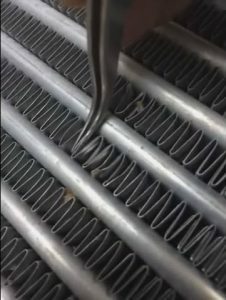 The most noticeable visual sign of a damaged intercooler / aftercooler are the warped fins due to excess air pressure as well as excess amount of oil all over the unit. Overall CAT 3306 Airflow Issues concerning the turbocharger and aftercooler are just as common as any other diesel engine. CAT engines, especially, Caterpillar marine engines are prone to faulty aftercoolers and are prone to corrosion in humid or wet conditions. The most simple fix for air flow issues is to check the life of the intercooler hoses as well as the bearings on the turbocharger.